Though the basic meditation instruction is straightforward, when I’ve talked with teachers, friends, and students, I’ve learned that even among practitioners in the Plum Village tradition, there are many different ways to begin a session of sitting meditation, many different methods and routines to quiet our bodies and our minds. It depends on the teachers and meditative traditions we have encountered. It depends on our personal history and mental make-up. And the practices we use may vary from one sitting to the next, depending where and when we are sitting, our state of mind prior to the sitting, how sleepy we are, and the issues and challenges that are alive for us. When I practice sitting meditation, I do not open the doors of the eyes, the ears, the nose, the tongue, the body, or the mind, and yet I feel very alive. I feel cozy. I practice breathing in mindfully and I touch the fact that I am alive. I touch the miracle of life within me. I enjoy breathing in and breathing out. I generate the energy of mindfulness. Mindfulness is the energy that can help protect us. In the Buddhist tradition, mindfulness is the essence of a Buddha. A Buddha is someone inhabited by the energy of mindfulness. Mindfulness is the energy that allows you to know what is going on. What is going on is that you are alive. What is going on is that you have a body. What is going on is that there is a paradise of forms and colors available in the here and the now. This Thursday evening in our program, we will share, and ask questions, about what we typically do when we are sitting in meditation, and how we might change what we do because of particular circumstances. Br. 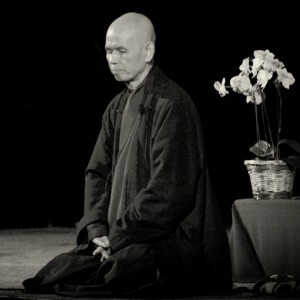 Phap Vu, a monastic Dharma teacher in the Plum Village tradition, will join us. Below is another except on meditation by Thich Nhat Hanh and a poem, Reasons to Meditate, by Lisa Cullen. Meditation lets the sun of awareness rise easily, so we can see more clearly. When we meditate, we seem to have two selves. One is the flowing river of thoughts and feelings, and the other is the sun of awareness that shines on them. Which is our own self? Which is true? Which false? Which is good? Which bad? Please calm down, my friend. Lay down your sharp sword of conceptual thinking. Don’t be in such a hurry to cut your ” self” in two. Both are self. Neither is true. Neither is false. They are both true and both false. We know that light and color are not separate phenomena. In the same way, the sun of self and the river of self are not different. Sit with me, let a smile form on your lips, let your sun shine, close your eyes, if need be, to see your self more clearly. Your sun of awareness is only part of your river of self, isn’t it? It follows the same laws as all psychological phenomena: it arises and vanishes away. To examine something with a microscope, a scientist must shine light on the object being observed. To observe the self, you must shine light on it too, the light of awareness. I just told you to put down your sword of conceptualization and not cut your self into sections. Actually, you couldn’t, even if you wanted to. Do you think you can separate the sunshine from the green color of the leaves? You can no more separate the observing self from the self observed. When the sun of awareness shines, the nature of thoughts and feelings is transformed. It is one with the observing mind, but they remain different, like the green of the leaves and the sunshine. Don’t rush from the concept of ” two” to the concept of “one.” This ever-present sun of awareness is at the same time its own object. When a lamp is turned on, the lamp itself is also brought to light. “I know that I know.” “I am conscious of being conscious.” When you think, “The sun of awareness has gone out in me,” at that moment it re-lights itself, faster than the speed of light.